First, choose one of two base units we offer. One base unit supports capture card, USB, Thunderbolt, Firewire etc., type interfaces and the other base unit exclusively supports Ethernet based cameras. Choose the appropriate base unit for your application. Cost for the card based standard or Ethernet base units are the same. To get a fully operational MultiScopeCompact system up and running, a hosting unit and at least one AV plug-in bundle must first be purchased and registered. The hosting unit can be purchased using the PURCHASE link shown just below and to the right. To control link SPAM, a captcha code must be entered before access to the purchase page can be granted. Plug-in selection and purchase are on a different web page. One such link is located at the bottom of this page. Thank you for your patience. 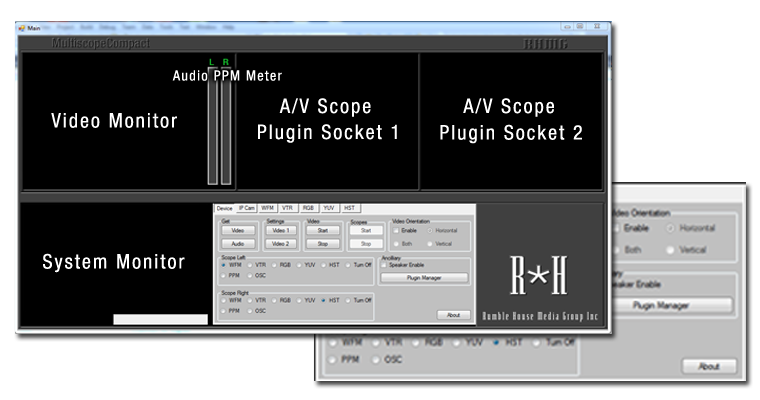 Get all plug-in descriptions, module pricing and links for purchase.